Hollie Cradduck went from a non-athlete to forming part of Team GB racing at Kona, a huge challenge she had taken on for her cousin Rosie, who tragically died in her sleep at the age of 19 whilst supporting her at her first Ironman race in Tenby two years ago. On Saturday the 10th of October 2015, Hollie realised her dream, and did Rosie proud. asked her what her kit was all about. Hollie told me that she was training for the Ironman World Championships in Kona, Hawaii. “Wow!” I said, with a pang of envy. Hollie told me that she had moved to Lanzarote from the UK to train for the race, having qualified in Tenby, Wales in 2014. She told me that she was raising money in memory of Rosie. We smiled and said good luck, and put our heads down. I saw that vision in pink headed for Kona a few times that day. Little did I know at the time just what an incredible and inspiring journey Hollie was on when I met her during that race. Hollie’s dream of ‘just finishing’ an Ironman became a reality in a better than expected time of 14:05:33, coming third in her age group at Tenby, Wales (one of the hardest Ironman races in the world) on 8th September 2013. “I finished an hour before my expected finish time and three hours before cut off” Hollie said. Tragically, this was to be the best and the worst day of her life. 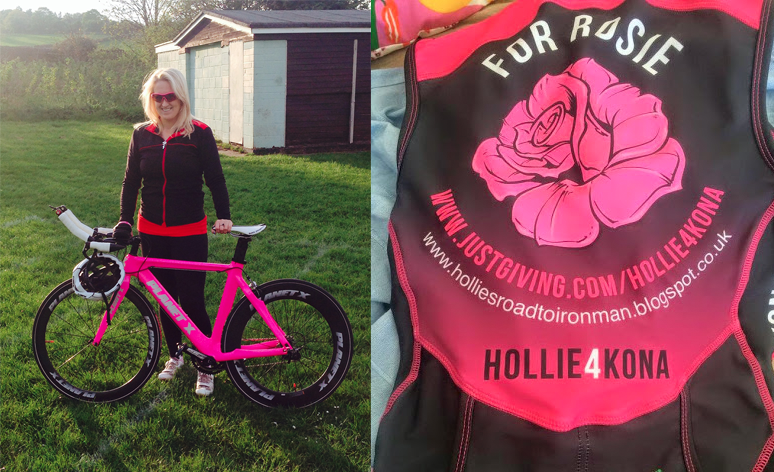 After becoming an Ironman, Hollie learned that her niece, who was like a sister to her, had tragically died unexpectedly whilst she was in Tenby supporting her. “I was only three when Rosie was born, we had a close sisterly bond.” Hollie said. Lying awake in bed after her race, staring at the ceiling, Hollie decided that she would raise awareness for sudden nocturnal death in epilepsy (SUDEP) by racing in Kona. Holly decided to raise awareness for SUDEP via her Hollie4Kona campaign. “I wanted to do it for Rosie, and I wanted to qualify. I didn’t want to do it any other way.” said Hollie. Racing in Kona isn’t something that you can buy (unless you are Gordon Ramsey). It is the holy grail for triathletes, the World Championships, entry by qualification only. It takes serious commitment on a whole new level to training for any other Ironman race. It’s fiercely competitive and there are only a handful of places available at every Ironman race, and controversially, less for woman than for men (See ‘5Q’ 50 Women to Kona cause), yet this is actually reflective of the number of women that race Ironman events versus men, which although growing year on year at a decent rate, is still generally less than 20% in the UK, although in America this has risen to over 37% (up 10% in 4 years). And go for it she did. Hollie decided to quit her demanding job, and move to Lanzarote, where I met her, to train hard, to get into Kona. Yet in between deciding to move to Lanzarote and leaving the UK, she qualified unexpectedly at Ironman Wales. “I decided to go to Lanzarote and get strong for Kona instead.” Hollie explains. On October 10th 2015, Hollie joined over 120 athletes to become part of Team GB at Kona and reached her huge goal, through grit and determination, finishing in very hot, humid conditions in 14:12:22. Raising money and awareness together with her sister (Rosie’s mum) who ran the London Marathon, over £18,000 has been raised in Rosie’s memory so far.